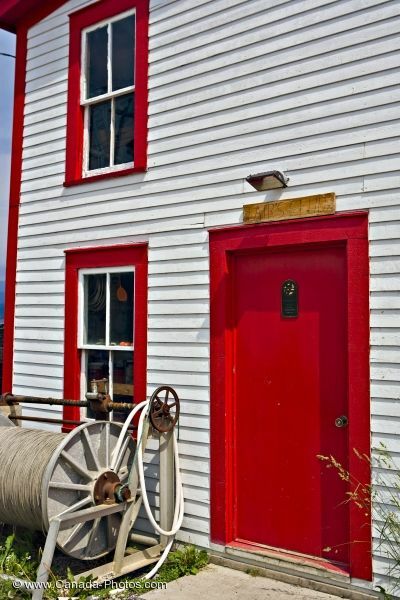 The red and white historic building along the coastline of Woody Point in Newfoundland, Canada is home to the Roberts store. The Roberts Store in Woody Point in Newfoundland, Canada has been reconstructed over the years to ensure that the historic building stays in its original condition. The building has been painted white with the trim, window frames and doorway being bright red in color. The windows and doors are the original ones which were put in when the building was erected. Around the historic property, visitors will find an assortment of buildings and items which all relate to the early years of the 1900's. Picture of the historic building which houses the Roberts Store in Newfoundland, Canada.